Join the FREE 10-Day SMART Decisions Challenge! You can join the Challenge at any time! Get all the content of the 10-Day Challenge in one handy ebook delivered directly to your inbox. For just $10.95 you can access everything you need NOW with no waiting. I CHALLENGE YOU TO GET YOUR END-OF-LIFE WISHES IN WRITING NOW! All it takes is a little of your time each day for 10 days ... along with guidance and information, which you will receive during the challenge. At the end of 10 days your advance directives will be complete and you'll be ready to move peacefully through life's ups and downs without fear or regret! During the 10-Day SMART Decisions Challenge, I'll be sending you a series of emails with the resources, inspiration, tips, and tools you'll need to make careful decisions and complete your advance care paperwork. You'll be one of many members of our SMART Decisions Community who are meeting the challenge to plan ahead for the end-of-life. I've discovered that thinking about these choices in advance has given me peace of mind and a sense of freedom as I go through later life. I can't wait to share this great feeling with YOU! As part of the challenge you'll learn about the 5-step SMART Plan for making decisions about your end-of-life healthcare, which includes recording your choices and sharing them with the important people in your life. At the end of the 10 days you will have your healthcare paperwork completed and be ready to celebrate that you are now prepared for (almost) anything! TRANSFORM YOUR LIFE NOW BY PREPARING FOR THE FUTURE! Get ready to answer questions and explore your values about life and the end-of-life. You'll find inspiration and meaning for all the rest of your days! "Through my years of working with hospice patients I have learned some important lessons, such as what really matters in life and in death. I no longer fear death, I'm prepared for the future, and ... even more importantly ... I LOVE LIFE! This is what I plan to share with you through the 10-Day Challenge! I hope you'll join me!" 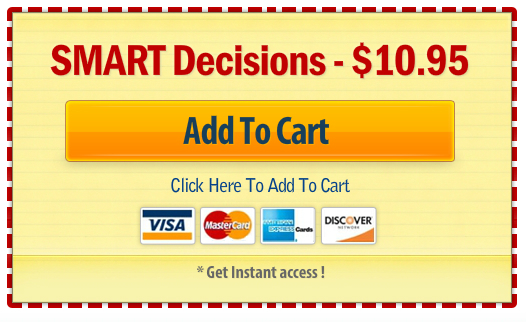 Get the SMART Decisions Guide Book!